From our first days in an old creamery in Charlotte, Vermont, way back in 1983, we at Storey have stayed true to our original vision: to provide dependable, affordable, nuts-and-bolts advice that makes sense and looks good. Today, our home is in the beautiful Berkshires of western Massachusetts, and we have more than 600 active titles and over 49 million books in print. 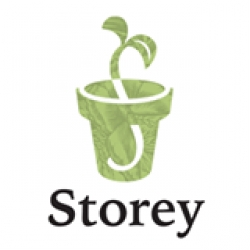 For 30 years, Storey has promoted the practical virtues of creative self reliance. We’re passionate because we do it too — we’re gardeners, knitters, brewers, picklers, cooks, beekeepers, riders, hikers, builders, farmers, writers, and lovers of the outdoors. (Whew!) Somewhere along the way we got hooked — we found a great teacher or read a great book and were inspired to do more. We watched our mother knit and copied her movements. We sat under the stars, then built an Adirondack chair to sit a while longer. We’re self reliant, but we haven’t done it on our own. Our library of sustainable skills has grown from the accumulated wisdom of generations: Learn to do something well and pass that knowledge along. Repeat. Repeat. Repeat. At Storey, we’re dedicated to continuing this tradition. If you want to get your hands dirty, we’ll be there.